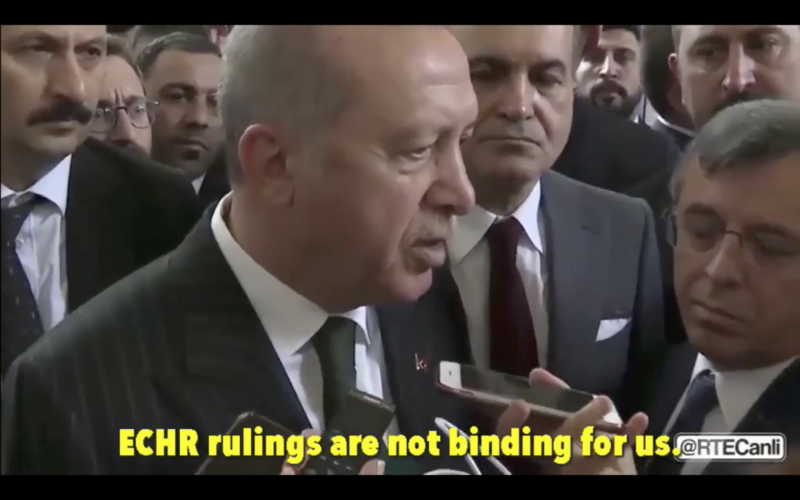 President Recep Tayyip Erdoğan on Tuesday said that Turkey is not bound by verdicts of the European Court of Human Rights (ECtHR) following the court’s decision calling for the release of Kurdish leader Selahattin Demirtaş from a lengthy pre-trial detention. “ECtHR decisions do not bind us. Up until now, most of the decisions about the organization [Kurdistan Workers’ Party (PKK)] have been negative. There is a lot to be done in reaction [to the verdict]. We will take steps in response and finish the case. Terrorism continues,” Erdoğan said in parliament after the ruling. Demirtaş, who is the leading Kurdish politician in Turkey and was the co-chairman of the Peoples’ Democracy Party (HDP), has been behind bars on charges of terrorism related to the PKK since November 2016 along with several other Kurdish political figures in the country. This article originally appeared on Turkish Minute on Nov 20.